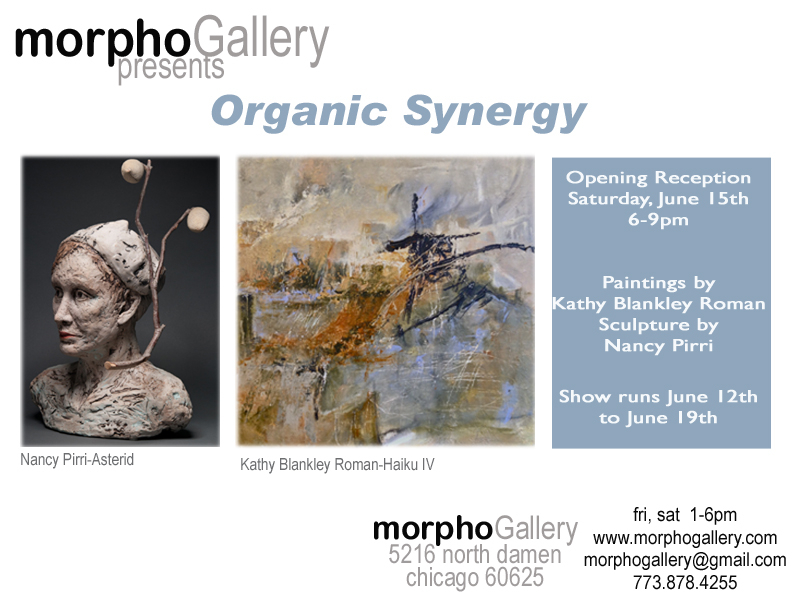 Chicago (June 2013) — Morpho Gallery is pleased to announce the opening of Organic Synergy featuring the work of Nancy Pirri and Kathy Blankley Roman. Featuring a blend of acrylic paintings and sculptural works, this multimedia exhibition will highlight the careers of both women, while also debuting their recent work. An opening reception will be held Saturday June 15th, from 6 – 9 pm. Organic Synergy will run from June 14th – June 19th, 2013. Kathy Blankley Roman is an abstract artist who primarily works with acrylics combined with various dry drawing media. Her tendency to an earthy palette is influenced by her exposure to pictures of the cave paintings at Lascaux and Altamira as a child. While Roman has been drawn to the arts throughout her life, her retirement in 2011 allowed her to experiment with new techniques and mediums. Her works are often described as serene, with a sense of calm and depth that draws the viewer in. She was awarded a Top Ten Artists Award in 2012 from the Abstract Artists Gallery’s Annual International Abstracts Competition and was recently featured in Sue St. John’s book “A Journey into Abstracts -Vol. 4,” a collection of forty contemporary artists in which each describes the step-by-step process of creating their featured works. Nancy Pirri is a sculptor that emphasizes the sense of earthiness and antiquity associated with the medium. Her work epitomizes woman’s struggle to find emotional balance and the complex roles that women take on. A randomized but controlled application of colored slips and intermittent firings enhance the textures of her sculptural pieces, strengthening their tie to mother earth and the intricate patterns of the earth. To this end, Pirri is noted for her use of the soda firing technique, which intrigues her because of its random and uncontrollable flashes of color and orange peel surface. Born in Brooklyn, NY, Pirri now resides and works in Chicago. She was recently hand-selected for the Art of Human Rights event for Heartland Alliance, and is currently represented at Gallery Guichard in Chicago and Studio b in Three Oaks, MI. This entry was posted in Openings and Events and tagged art, Chicago, Kathy Blankley Roman, Morpho Gallery, Nancy Pirri, sculpture. Bookmark the permalink.